I started my hairdressing career when I was 14 by going to college as a day release from school; this is where I decided hairdressing was the career for me. From there I looked at the different ways you can get into hairdressing and decided the apprenticeship route was the best suited to me as I enjoy the salon atmosphere and felt it was going to give me the best training possible. My careers adviser put me in touch with Topknots in Heathfield as they had the best reputation for hairdressing and training in our area. I was very lucky to join their cutting club, which was a club that ran on a Tuesday after school, where we learnt everything from shampooing to cutting and colouring hair. This then leads into a Saturday job in the salon, which gave me the opportunity to see and learn how a salon runs. Although I only started doing the very basic jobs like making refreshments and making sure the salon had enough clean towels and sweeping the floor, I was always really busy and learning lots of new skills by watching all the stylists. I started my NVQ full time upon leaving school in 2002, I couldn’t wait to get trained and become a successful hair designer. Throughout my training, I was always inspired by learning lots of new things and would always be first to book to go to shows and training events. When I completed my NVQ level 2 alongside the Topknots in-house training program the following year in 2003, I was very excited to build up my clientele and do the best I could for my guests. That year I was very proud to receive the Topknots Student of the Year. After a year in the salon in Heathfield working on the Graduate level, I had built up a good client base and was promoted to the Hair designer level. Shortly after this Gary suggested I join the Paul Mitchell Artistic team which he is a part of, The team educate for Paul Mitchell at events around the UK teaching other hairdressers new colour, cutting and styling techniques. To join the team we had to learn everything about Paul Mitchell colour and takehome products, after which we went on a two-day training and accreditation course in Aylesbury. This is where I learnt how to educate and present to others at the end of the two days we took an exam on Paul Mitchell colour, products and the chemistry of hair. I passed my exam and became a senior associate with honours. Over the time I have been working as an educator for Paul Mitchell I have always wanted to improve my knowledge and skills every year and have had a lot of opportunities on the journey to becoming a platform artist and working alongside Gary and the rest of the senior team. I have also been fortunate enough to have training and coaching from the American Paul Mitchell Art directors who are very well known in the hairdressing industry. Over the years working with Topknots I have used the knowledge & skills I learnt with Paul Mitchell in the salon with my guests to help them get the look they want and to manage their style at home. In 2006 I won designer of the year and in 2007 won star of the year of which I was very proud. In 2007 the owners of Topknots Ian & Gaye retired and sold the company which soon became the ‘Great Hairdressing group’ which it is still known as today. I continued working for the new owners and continued to enjoy my work rising up through the promotion levels in the salon. In 2008 I moved to the Eastbourne Salon on the Sovereign Harbour as I moved house to Eastbourne. I was lucky fortunate that a number of my Heathfield guests followed me to the Eastbourne salon. The following year 2009 I was given the opportunity to manage the salon in Eastbourne, which was something I really wanted to do. I managed a team of 10 and learned a lot from the experience. In 2011 I felt I had accomplished all I could with the Great Hairdressing Group and it was time to move on to what I know will be an even more successful future at the Grove Experience. Since joining the Grove Experience team I have completed two years of 365 business courses which I really enjoyed getting to learn more on the business side of the hairdressing industry. After having two years out of the Paul Mitchell Artistic team to complete my business courses, I really couldn’t wait to get back into the team and start doing some show work again. I have completed my Paul Mitchell Prev-you training which is where we get assessed on colour and cutting techniques and styling looks which we will then be educating in the shows. I enjoy learning new skills and have learnt how to do Hot towel wet shaves which is another service I am now offering my male guests. I have also learnt Threading which is a technique using thread to remove hair, It was originally used on men to remove mono-brows but is now used on ladies as well to remove unwanted hair and reshape eyebrows. October 2015, I started volunteering at St Wilfred’s Hospice cutting and styling hair for patents and their family’s. I really enjoy giving back to my local community. IN 2016 I won the salon designer of the year, and then again in 2017. In the future I would be interested in having or running my own branch within Experience Hair design, I would also like to get into more Media work with Paul Mitchell doing photo shoots for magazines. I currently live in Eastbourne a short walk from the salon with my Husband Tony and our dog Ernie. I am lucky to have a great group of friends which I enjoy spending time with. My family have always been a great support network for me from when I started my training right up to now and are always keen to see me doing well in what I enjoy. 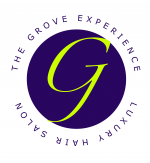 I look forward to welcoming you as a guest at the Grove Experience soon. Lovely violet hair! After 7 years of being a (very dyed) red head, I spent months of endless attempts and strand tests to try and go violet. My hair was in an awful state and very resistant to colour. I had previously been promised the earth by several hairdressers, before the strand test results arrived, only to be told "You should stay red". I went to The Grove Experience after a couple of recommendations from friends. I was not disappointed. Kiki worked on my strand tests to achieve the colour I had been after for so long. I had to have my hair bleached initially, in order for a semi permanent colour to go over the top. Again, something that other hairdressers stated would not be possible in the same day. I was very apprehensive about this, as I was concerned that the overall colour might be patchy or 'orange' in parts as I have dark brown roots and very dry copper ends. Kiki put me at ease about this and spent her time on my hair to achieve a very natural 'bleached' colour foils with a burgundy surround, before placing the violet over the top. She was very helpful with how to achieve the result I wanted. My hair is now in much better condition than before and after 5 hours of colouring, I was not charged anymore than a normal 'full head' of colour. Remy blow-dried my hair and did a fantastic job of making it curly and shiny, before explaining the products she had used. All of the staff were incredibly friendly and the atmosphere is lovely - not to mention those massage chairs and head massages! They even nipped out to get me lunch. Fab place with lovely people. Thank you for making me love my hair again! Next appointment already booked.